160 - 6 meters, 100 Watts of Reliable Power from a cool radio! Solid SSB and CW power on 160 through 6 meters adjustable in increments from 5 watts to the full 100 watt output. AM - 5 to 25 watts output. • Ultra-stable and high-power Final Amplifier Stage incorporates a high efficient reliable RD100HHF1 MOS FET in a push-pull configuration, using a supply voltage of 13.8 V, cooled by a huge 1400 cc die-cast aluminum heat sink with a high coefficient of thermal conductivity. • A thermostatically-controlled 2.35"/60mm axial cooling fan engages at 40 deg C/104 deg F, and it features four speeds, depending on the degree of cooling required. The large bearing surface of the fan, its floating mount, and the unique heat sink design combine to make the cooling system incredibly calm and quiet, yet very efficient. 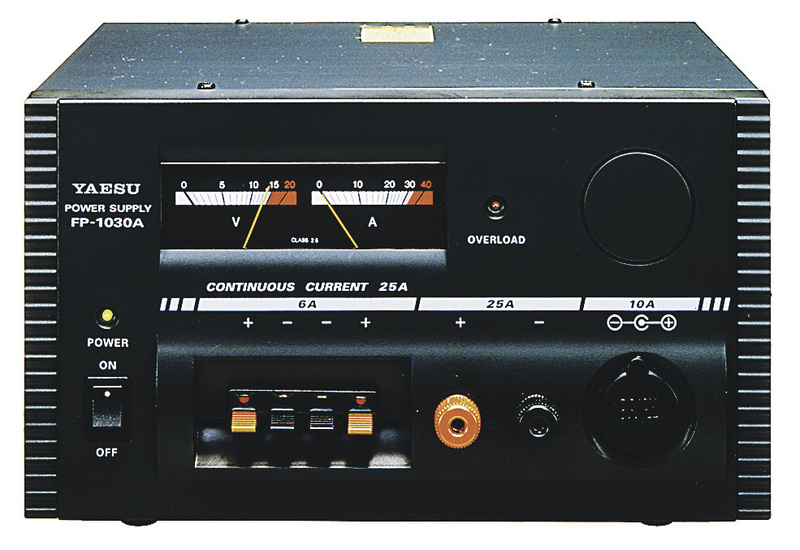 The front panel "Block Diagram" display shows the current status of a number of functions in the receiver of the FT-950. With one glance, you can see your settings for a number of critical functions of the radio. And you will also see Bar Graphs depicting several different DSP filter settings at the same time for quick alignment. ** Spectrum Scope with LBWS - The RF Band Scope allows you to view activity within a span of 25 kHz, 100 kHz, 250 kHz, 500 kHz, 1 MHz, or 2.5 MHz, depending on your requirements, with a fixed sweep speed for seamless transition between spans. Additionally, the YAESU-exclusive LBWS (Limited Band Width Sweep) allows you to reduce the bandwidth to 50%, 30%, or 10% of the original, imparting a corresponding increase in the sweep speed, if you like. By sweeping just a limited portion of the main Band Scope at high speed, you will get a superbly detailed view of activity in that segment of the overall band, allowing you precise zero-in capability not found with competing products. With a 50% reduction, you will get double the speed; with reduction to 30% of the original sweep, you will get a 3X increase in speed, and by reducing the bandwidth to 10% you will get a whopping 10X increase in the sweep speed. You can use the " " and " " keys to move the remaining window, as desired. You may choose the Spectrum Scope Function (which will plot your current operating frequency in the middle of the monitor screen) or the Band Monitor Function (which will be checking the whole band you are currently operating). At the Band Monitor Function, you will be able to set the lowest starting frequency at your preference (for CW or SSB operation). The lowest starting frequency will not be purged if once set up even if you change your bandwidth. ** Audio Scope/Oscilloscope Display Function - The Audio Scope Function and the Oscilloscope Function of the DMU-2000 may be the most useful capability of the Data Management Unit. The Audio Scope portrays the audio spectrum of either the receiver passband or your transmitted signal, allowing you to visualize the frequency components as you hear them. This function also enables you to make adjustments to, such as, the Notch Filter, Contour control or (on transmit) the Parametric Microphone Equalizer. At the same time, you may use the Oscilloscope to look at the X-Y characteristics of an incoming signal with variable level and sweep speed, or to check CW tone pitch, etc. **Swept-Frequency SWR Display - As you tune across the Amateur band and transmit at different frequencies, the DMU-2000 will plot the SWR across the band, alerting you to any unusual SWR situations, etc. ** Memory Channel List - You may edit and confirm your memory frequency channels, with easy on your big screen, such as to add an alpha/numeric "Tag" to each memory for quick recall of the channel's identification. ** World Clock Display -The World Clock function includes a world map with entries for a number of locations throughout the world, so that you will see what the time of day at the other end of our QSO or anywhere in the world. Of great advantages value to serious DXers is the Sunrise/Sunset depiction, which shows the "Gray Line" area where propagation frequently is enhanced. An alarm feature is also included, to alert you of a schedule time. ** Rotator Control Function - The Rotator Control Function includes the Great Circle Map that allows you to aim your directional antenna accurately (e.g. Tokyo seems to be located West from San Francisco though it is more actually located to the NNW direction) and the imbedded database of worldwide cities may be used to determine a specific bearing to a DX location, if you like. The Rotator Control function further lets you control the left(C-C-W)/right(C-W) rotation of your Yaesu G-800/1000/2800DXA series rotator, in addition to permitting speed control and setup of preset beam headings. And, if you use your after-market keyboard for input of your latitude and longitude, the DMU-2000 will lie out compute and display a Great Circle Map centered on your location! You may also connect a GPS Unit (one capable of output of NMEA0183 position data) to your DMU-2000 to download precise position data. ** Log Book Feature - By connecting an after-market keyboard and monitor to the DMU-2000, you can utilize the on-board logging capability of the FT-2000. The Log Book includes an extensive database of DX information, and you may archive your log data to the supplied CF card using one of the popular and available logging formats like ADIF, Cabrillo, etc. On the lower Amateur bands, the signal voltages impinging on a receiver can create noise and intermodulation effects that can cover up weak signals you're trying to pull through. Three modules (MTU-160, MTU-80/40, and MTU-30/20) are available – these modules may be connected externally with no internal modification required! The RF µ-Tuning filters utilize a stack of large 1.1" Ni-Zn Ferrite cores, driven through a silver-plated coil assembly by a precision stepper motor. The resulting high Q (typically over 300) provides a very steep resonance peak near your operating frequency. (On the 160 m band, typically -3DB@?12 kHz, -30DB@?450 kHz.) And the 3rd order Intercept Point (IP3) is increased by 4 dB with the RF µ-Tuning system. The ferrite cores utilized in the RF µ-Tune filters are driven by a high-resolution, high torque stepper motor (4-phase unipolar motor/2-phase magnetization system) with angular resolution of 1.8deg. The synchro belt drive has an estimated lifetime of more than 10,000 hours of actual operation. For 160-meter operation, the ferrite core diameter is a full 2.2"! The RF µ-Tune system tracks your operating frequency, although you can chose to manually skew the frequency response when special interference conditions require it. The front panel's oversized 2.67" (58 mm) Main Tuning Knob is crafted using a heavy brass alloy (knob weight: 6.7 oz./185 g) for easy flywheel-effect frequency excursions or precision tuning of weak digital signals, thanks to the precision magnetic rotary-encoder tuning mechanism coupled to the Main Tuning Knob. The Main Tuning Dial is the same structure used for the FT DX 9000/ FT-2000 series radios utilizing traditional dial structure along with a specially designed rotating skirt that creates a small air gap. This air gap reduces sweat accumulation on the operator's fingertips, enhancing tuning precision during long operating sessions. The RF amplifier stage is designed for low and high intercept, utilizing two strong series-connected 2SC3356 bipolar transistors with negative feedback for consistent, repeatable performance. The low noise figure and carefully-controlled stage gains ensures that only the precise amount of gain needed is actually utilized. And the front-panel "IPO" switch lets you select direct feed to the first mixer (IPO), Preamp 1 (RF AMP1), or Preamp 2 (RF AMP2) which adds the second preamplifier stage in series, according to the antenna in use and the noise and interference conditions present at the time. The incredibly sharp "brick wall" filters of the IF DSP system can expose characteristics of incoming signals that you have never heard before; not all of them are really pleasant to listen to all of the time. But, using the CONTOUR control, you can roll off low-frequency or high-frequency components so as to shape the receiver passband differently, or null out part of the mid-range area, with continuous adjustment throughout the passband. By nulling out interfering or irrelevant frequency components, the desired frequency components will significantly rise out of the background noise, improving fidelity and signal-to-noise (S/N) ratio. The IF Transmission Monitor allows you to listen to accurate reproduction of the transmitter's IF signal for making precise adjustments to the Parametric Equalizer, SSB Bandwidth, and/or Speech Processor. The Monitor Level may be adjusted from the front panel. The CW SPOT switch engages a spotting tone that matches the offset of your transmitted signal (as set by the CW Pitch selection), allowing you to match that pitch to that of an incoming signal perfectly. The CW pitch frequency will be shown while pressing the "SPOT" switch. There's no more accurate way to be sure you're exactly on frequency! 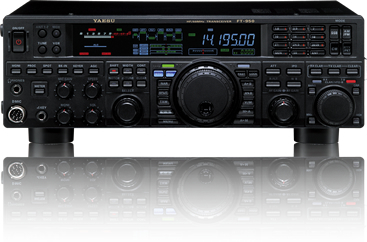 The FT-950 is designed with today's fast-moving contest operator in mind. Two antenna jacks (SO-239) are provided along with one-touch access capability. The antenna selection is memorized in each VFO and memory channel register, and the radio remembers which antenna you last used on that band or memory! Pressing the "SPLIT" key for about one second or more engages the "Quick Split" feature, which automatically separates the receive and transmit frequencies by 5 kHz (the TX frequency will be 5 kHz higher). You may also engage this feature by just pressing the combination LED switches near each VFO dial ("Main Dial" and "CLAR/VFO-B") to select which VFO to use as TX (or RX). When operating Split, pressing the "TXW" key will instantly let you receive on your transmit frequency to hear activity in the pile-up you are trying to break through.